Friends University will accept post-secondary academic work completed for credit at other regionally-accredited institutions and recognized foreign universities. A maximum of 69 credit hours earned from a 2-year or community college will apply toward your degree. In addition, we offer a Phi Theta Kappa scholarship to admitted transfer students who are Phi Theta Kappa members. Each scholarship recipient will be awarded $2000 per year. Renewal of the scholarship requires a CGPA of 3.5. The deadline for applications to be considered for the 2018-19 academic year is June 1, 2018. 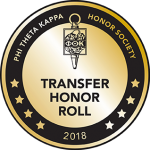 Phi Theta Kappa has recognized Friends University as one of 40 top colleges and universities nationally as members of the inaugural Excellence in Community College Transfer Honor Roll. This honor roll identifies the top four-year colleges and universities for creating dynamic pathways to support community college transfer. The colleges were judged on engagement, collaboration, impact and achievements related to the transfer of community college students as well as partnerships, support, admissions outreach, scholarship/financial aid, student engagement opportunities and institutional priorities. In addition, students who transfer to Friends University from another regionally accredited higher education institution can transfer up to 69 credit hours! For a full list of transfer course articulations, download the transfer articulations spreadsheet. The links below provide transfer guides for general education requirements for each of the following colleges and academic institutions. Friends University is very happy to partner with several regional community colleges to accept their associate degrees (AAS, AA, AS, AGS) with junior standing at Friends University in the College of Adult and Professional Studies (CAPS). Some of our articulation agreements are listed on this page. In addition to this, Friends University academic success coaches would be happy to work with the advisors at these community colleges throughout the completion of your associate degree program in preparation for you to transfer to Friends to complete your bachelor’s degree. If you are interested in this process, please see our Dual Advising Form for Transfer Students below. If you have any questions on this or whether Friends has a partnership with your community college, please contact us at 316-295-5300 or adultrecruitment@friends.edu. The purpose of the dual advising program is to give students enrolled at a community college the opportunity to access academic advising and/or academic success coaching with Friends University staff throughout the completion of their associate’s program in preparation for transferring to Friends to complete a bachelor’s degree. The goal of the program is to provide a seamless transition for students transferring from partner schools by providing support throughout a students’ academic journey. Students should complete the dual advising application at the time of enrollment at the community college of their choice. 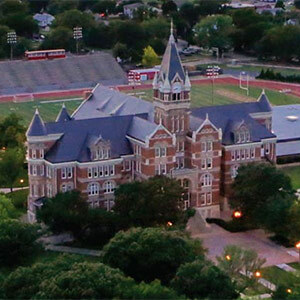 Students may complete the dual advising application prior to applying for admission to Friends University. A separate application will be required when students are ready to transfer. Students must achieve a high school GPA or cumulative college GPA of 2.0 or higher. Visit the Dual Advising page for more information and complete the form to get started in the dual advising program.